Model 1940 Micro Manipulator with Digital Display Console is our most advanced Micro Manipulator featuring 3 axis, 1 micron resolution linear glass scales with digital display console. 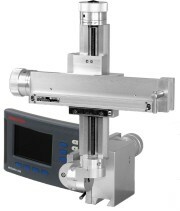 Model 1950 Off-Plane Insertion Tool is designed for angular presentations, offering two additional axes of manipulation when used in combination with a Kopf 1900 series micro manipulator. Model 1923-B Mouse Gas Anesthesia Head Holder features a custom nose clamping device that can be utilized for delivering gas anesthesia. Model 1924-B Neonatal Rat Gas Anesthesia Head Holder features a custom nose clamping device that can be utilized for delivering gas anesthesia. Model 1929-B Rat Gas Anesthesia Head Holder features a custom nose clamping device that can be utilized for delivering gas anesthesia. Model 1905 Stereotaxic Alignment Indicator provides dimensional feedback required for leveling the head. Model 1910 Dial Test Indicator is a necessary tool used for calibrating Model 1940 Micro Manipulator. Model 1911 Stereotaxic Drill designed for use on Model 1900 provides precision common centerline position for burr hole. Model 1915 Centering Scope 40X magnification is used to assist with positioning Model 1940 manipulator accurately. Model 1966 Single Cannula Holder is specifically designed for hold Alzet/Plastic One cannula. Model 1970 Electrode Holder is custom adapted for holding specific electrode diameter to maintain an exact common vertical centerline position. Model 1971 Syringe Pump Adapter is designed to adapt Model 1972 Syringe Holder for use with UMP3 Syrnge Pump with Micro4 Controller for automated injections. Model 1972 Syringe Holder is designed to stabilize and position a Hamilton syringe while maintaining an exact common vertical centerline position. Model 1974 Single Cannula Insertion Tool universal design for holding 26 gage hypodermic needle. Can be easily adapted for 32 and 21 gage tubing. Model 1975 Glass Pipette Holder is designed to hold glass pipettes.